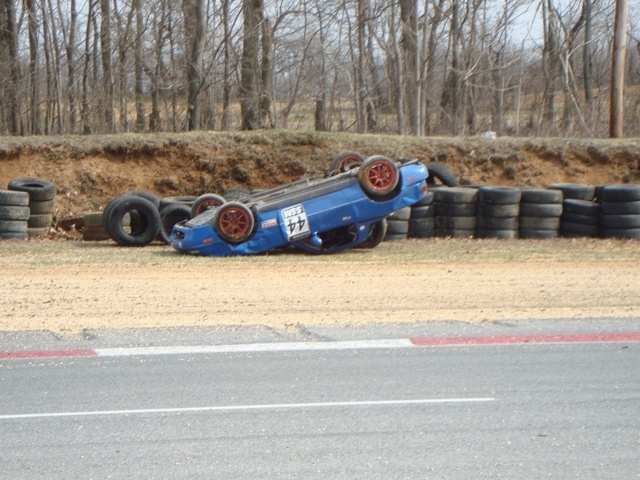 In the first day, Bob had his first "off-track" experience including a tire wall and landing on his roof (see photo below). While that almost never occurs during the regular season, there were at least four different cars on their roofs during the three day training period (only 1 for Bob and 0 for Gavin). That may be a driver school record. It is amazing how much these drivers improve by the time they graduate. None of the drivers were injured - which is a testament to how good the safety equipment really is. Bob refrained from damaging the body of his replacement car but did manage to over rev the engine to the point that he had to pay the replacement cost for it. Gavin also had a minor fender-bender when another racer got loose and the unavoidable contact occurred. Unfortunately, Gavin also over revved the engine. Missing a shift can be damn expensive. Needless to say, both Bob and Gavin passed the driver school training and are proud owners of SCCA Club Racing Novice Permits and are eligible for wheel-to-wheel competition in the SCCA. If they successfully complete two races without incident (finish the race rubber side down), they will be granted their regional club racing licenses. 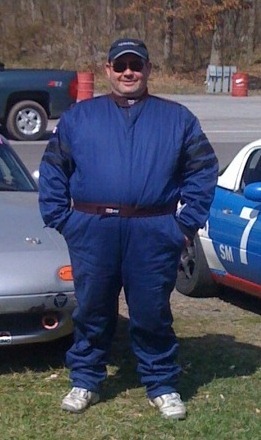 Bob now joins his brothers Larry and Ted Cahall in the world of Spec Miata Club Racing. Bob has since repaired the damage to his car and added a new paint job and number.